What do Bill Cole, "Sabre-Tooth Revisited," and The Crockett Almanacks all have in common? 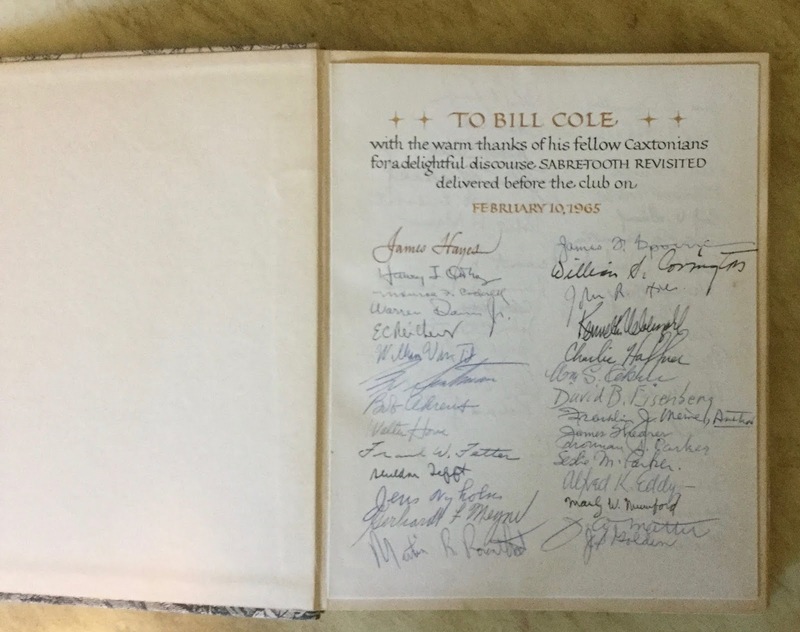 Bill Cole (1917-2011) was a member of the Caxton Club, a bibliophilic society in Chicago. "Sabre-Tooth Revisited" was the title of the discourse that Bill Cole delivered before the Caxton Club on Feb. 10, 1965. The Crockett Almanacks was the title of the book that the Caxton Club presented to Bill Cole in appreciation for his talk, "Sabre-Tooth Revisited." 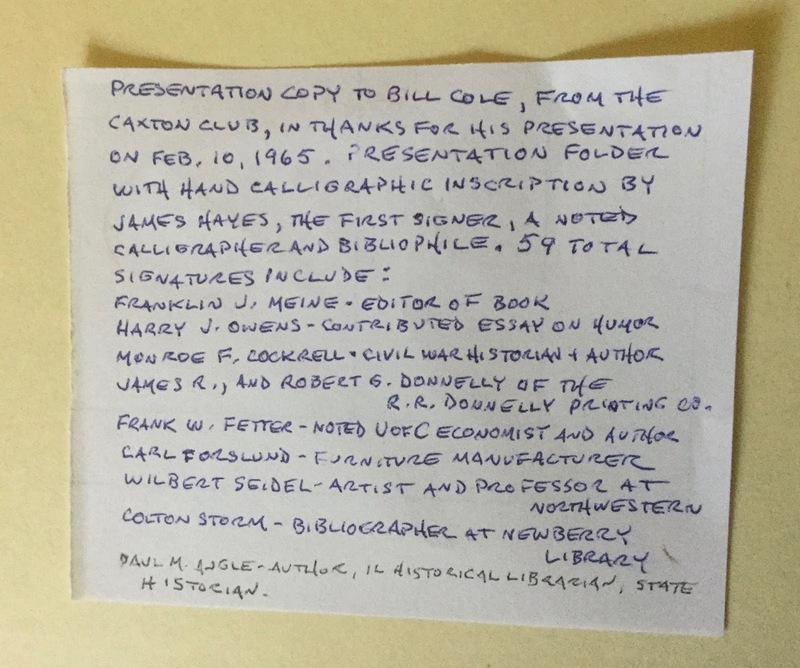 I have Bill Cole's copy of the book! I acquired the book on eBay this past July. I had two reasons for wanting this book. One was Davy Crockett. As a kid, I watched Walt Disney's miniseries of Davy Crockett in 1954 and 1955. And over 60 years later, I can still recite the words to the song: "Da-vy, Davy Crockett! 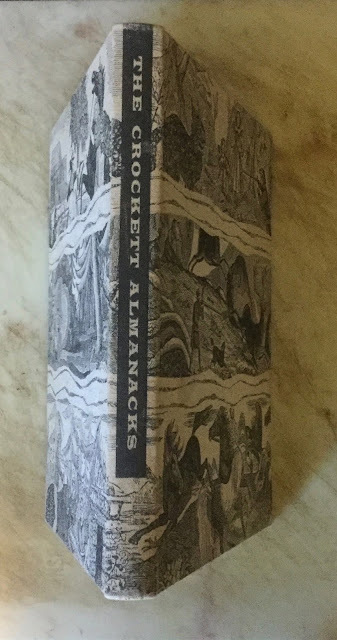 King of the Wild Frontier...."
There are several things I should tell you right off about the Crockett Almanacks: According to Crockett scholars, Davy Crockett (1786-1836) had nothing whatsoever to do with the Almanacks. And to this day, scholars still do not know the identities of the authors, printers, or publishers of the early issues of the Almanack. There was one S. N. Dickinson who, in 1840, claimed that his firm started the Crockett Almanacks. But scholars have never been able to substantiate his claim. 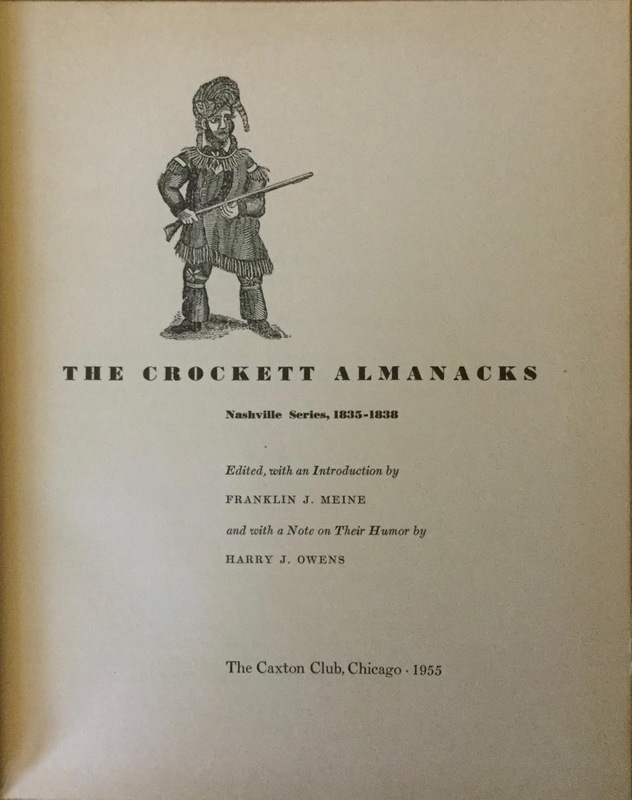 The first four issues were printed in Nashville, and are included in full in Franklin J. Meine's book, The Crockett Almanacks, which was published by the Caxton Club in Chicago in 1955. Meine himself calls the Crockett Almanacks "damn rare." Only three or four complete sets of the Nashville imprints were known to exist when his book was published. 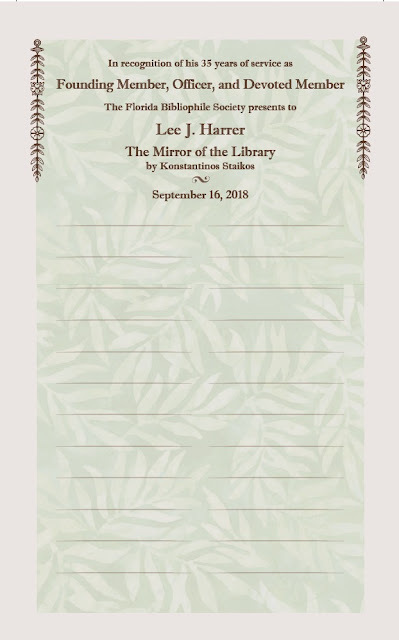 The first four Nashville imprints, however, were included in a collection of 21 Crockett Almanacks that were sold at auction by Dorothy Sloan Books on October 26, 2007. The price realized was $58,750. The story of the finding of these Crockett Almanacks sounds like something out of Rebecca Rego Barry's Rare Books Uncovered. It seems they were having a paper drive in Spencer, Iowa in 1947 to raise money to pay for uniforms for the high school band. And a collector and his daughter found the Almanacks on the curb in front of a house. The daughter kept the Almanacks until the auction in 2007. The other reason why I wanted the book was because all the Caxton Club members who attended the meeting and listened to Bill Cole's presentation signed the inscription sheets. And I am one of the bibliophiles who readily recognizes some of the names! 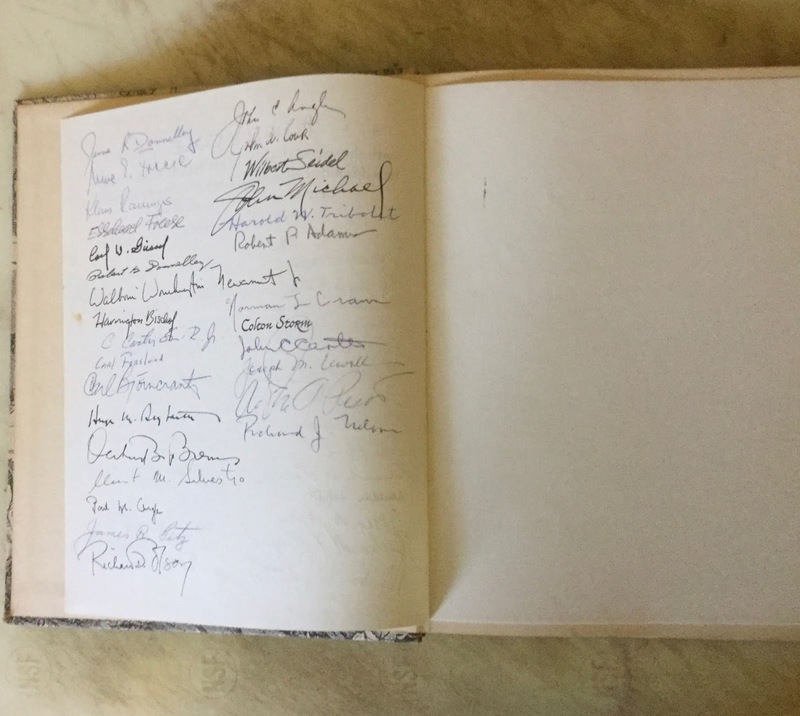 I can identify another one of the signers: the bookbinder Harold W. Tribolet. I have three books in My Sentimental Library Collection from his library. I liked the idea of the Caxton Club members signing the book. And now another bibliophile society is doing the same thing! As President of the Florida Bibliophile Society, I presented books to the speakers at our meetings. 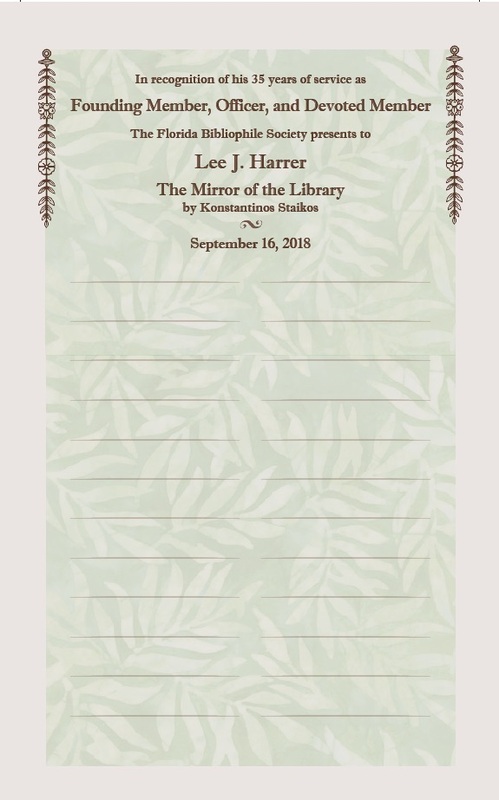 And I inscribed and signed them "on behalf of the Florida Bibliophile Society." No more! For our September 16th meeting, we had not one, but two books to present. And our Vice President, Charles Brown, created perfect inscription sheets ready for signing by our members! As for the choice of the first book, Gary Simons is a Samuel Johnson collector, and I knew he'd enjoy reading it. As for the choice of the second book, Lee Harrer's friend, the late Bob Fleck, published the book and even wrote the Introduction. So I knew the book would have a sentimental value to Lee. And yes, I checked with Oak Knoll to make sure that Lee didn't already have the book. 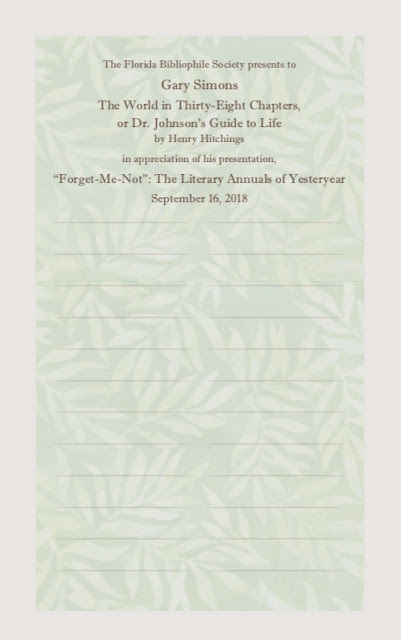 When it comes to books, I am one for turning over every leaf––or at least as many leaves as a can. And after reading the inscription on the Crockett book that the Caxton Club gave to Bill Cole, I wanted to learn more about him and the nature of his discourse, "Sabre-Tooth Revisited." I soon learned that there were a lot of Bill Coles. But only one of them, William G. Cole, was the author of "Sabre-Tooth Revisited." And this article was printed in a 1965 issue of Liberal Education: The Bulletin of the Association of American Colleges. Researching further, I found William G. Cole's Obituary online in The Chicago Tribune. I was now more curious than ever about "Sabre-Tooth Revisited." I wanted to read it! I attempted to find a copy of the Liberal Education issue that contained Cole's article. I found it! ABAA bookseller Willis Monie-Books in Cooperstown, New York had several copies of Liberal Education, including Volume LI, containing all the issues published in 1965. And "Sabre-Tooth Revisited" was published in the October 1965 issue. Bill Cole's article, "The Sabre-Tooth Revisited," is an article about education that is well worth reading. And I can now share it with you, and in an educational setting no less, thanks to the Association of American Colleges and Universities. I received permission from its Director of Publication and Editorial Services to post a hyperlink to a PDF of "The Sabre-Tooth Revisited" in my post. Enjoy! Cole, William G. "The Sabre-Tooth Revisited." Liberal Education. October 1965: 427-34.